For a man who made a lot of enemies during his tenure as the villainous Green Goblin, it was an incredible feat for Norman's alter ego to remain secret for many years after his 'death'. Of course it was not a product of some master plan, in fact, it took a combination of luck and his son's own demons to keep the truth hidden. But all good secrets do not stay secret for long and eventually Daily Bugle investigative reporter Ben Urich would go public with the history of the Green Goblin. His book entitled The Legacy of Evil, however, was not even published until after many of the Green Goblin copy cats had died as well. The reasoning for the lag in time between Norman's death and his outing as the Green Goblin is the focus of this section. After one last desperate attempt by the Green Goblin to kill Spider-Man went awry, Norman was impaled by his own glider...a seemingly fitting end to his villainous career. Spider-Man watched the glider kill his foe and left Osborn's lifeless body outside the Goblin's warehouse hideout for the authorities to find. However, Spidey was unaware that there was a third person present who witnessed the tragic event take place, Norman's son Harry Osborn. Harry, despite being in the midst of another drug relapse, was cognizant enough to remove the Goblin attire from his father's body (in the process, he moved the location of the corpse as well, something the authorities took note of). This action removed all direct evidence that Norman Osborn and the Green Goblin were one in the same. Harry's motivation for doing so (besides disentangling his father from the Green Goblin) was to create a public outcry for justice and revenge against Spider-Man for the death of the 'innocent' Norman Osborn. 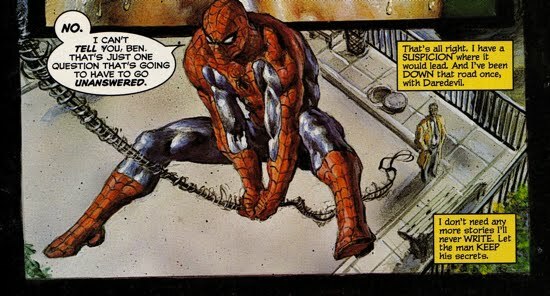 The next day, police and members of the media found Osborn's body surrounded by a significant amount of webbing and Goblin pumpkin bombs in Amazing Spider-Man #123. 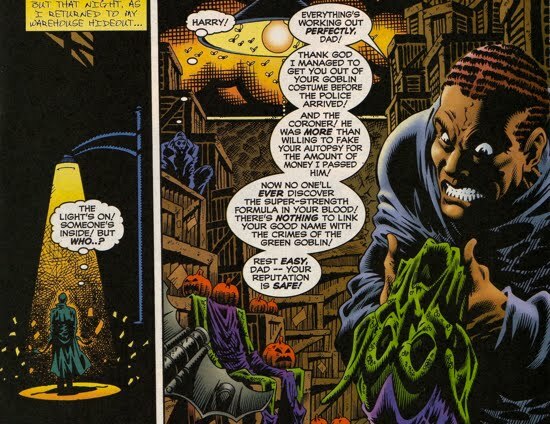 Without providing any theory as to why the pumpkin bombs were present, J. Jonah Jameson immediately blames Spider-Man for the death of Norman Osborn. Norman's body was eventually taken to the morgue and Harry began the second phase of the cover-up for his father. Harry bribed the coroner to fake his father's autopsy in order to prevent the discovery of any anomalies with Osborn's blood caused by the Green Goblin Formula. However, unbeknownst to Harry, the Green Goblin Formula that granted Osborn his superior strength and intelligence also provided him with a regenerative healing factor that allowed him to stave off death. Norman awoke inside the morgue and witnessed Harry's cover-up as well as his decision to follow in his father's footsteps and become the next Green Goblin. 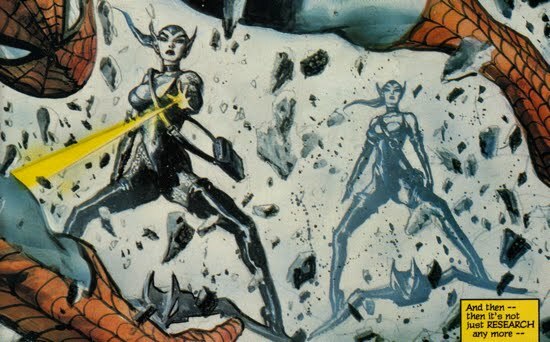 This sequence was presented as a flashback in the one-shot Spider-Man: The Osborn Journal. J. Jonah Jameson's war against Spider-Man continued as he hired Luke Cage to track down Spidey and bring him in to the authorities. This attempt failed and Jameson's crusade to avenge Norman's death quickly lost steam for two reasons. One, as Joe Robertson pointed out numerous times, there was not enough evidence (in fact there was only a small amount of circumstantial evidence) to warrant a case against Spider-Man. Two, Jameson became preoccupied with his son's unfortunate bout as the Man-Wolf. Jameson then switched from blaming Spider-Man for Osborn's death to blaming Spider-Man for his son's transformation to the Man-Wolf. 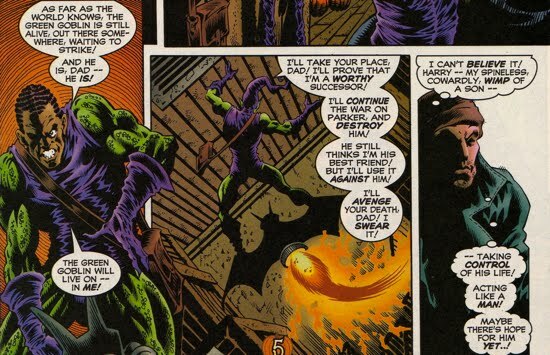 The second major piece of evidence that would have linked Norman Osborn to the Green Goblin occurred when Harry took over the mantle of the Goblin. Harry's war against Peter Parker led to a very public defeat by Spider-Man. However, luckily for Harry, Spidey removed any evidence that Harry was the Green Goblin before he was carted away by the authorities in Amazing Spider-Man #137. Both Harry and Norman dodged yet another bullet, keeping the general public unaware of their Goblin escapades. Months passed and Spider-Man was eventually cleared by the authorities for any involvement in the death of both Norman Osborn and George Stacy (as seen in Amazing Spider-Man #186). But Norman's Goblin past would not dissipate that easily, and after Roderick Kingsley (aka the Hobgoblin) uncovered a slew of Norman's hideouts he exploited Osborn's villainous past. Before Norman had 'died' he composed a series of journals that housed all of his maniacal secrets as the Green Goblin. Most of these 'secrets' were shady dealings with various prominent members of society, the kind of people that wanted these facts to remain secret. The Hobgoblin wanted to extort all of them over a long period of time in exchange for keeping the journals away from the public as seen in Amazing Spider-Man #249, 250, and 251. J. Jonah Jameson was amongst this group of people because he had confided in Norman in regards to his creation of the Scorpion (aka Mac Gargan). Norman must have recorded Jonah's involvement in one of his journals. The Hobgoblin's blackmail eventually led to Jameson stepping down from the Editor-in-Chief position at the Daily Bugle as the publisher came clean to the public for this involvement with the Scorpion. 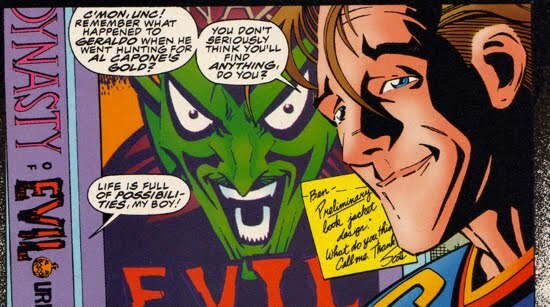 Jameson's confession did not have any impact on Norman's role as the Green Goblin, most likely Jameson was still unaware that Norman was the Goblin. But even if he was, he did not go public with that information, once again protecting Osborn's secret. At this point, the idea that Norman Osborn was (or could have been) the Green Goblin was most likely a theory amongst New York city's elite. The opulent group that would have comprised Norman's early cohorts would have had no incentive to come forward with that theory since it would have most likely indicted them for some type of illegal transgression as well. Ergo, Norman's secret remained safe for years after his death. But, like all good secrets, they eventually reach the light of day and for Norman and his Green Goblin persona it all began to unravel during Harry's final descent into madness in Spectacular Spider-Man #189. Despite enhancing his strength and intellect with a new version of the Green Goblin Formula, Harry was defeated by Spider-Man and taken away by authorities. The critical difference between this defeat and the others, was that the police had direct evidence that Harry was the Green Goblin after witnessing him (and subsequently arresting him) in the Goblin attire. 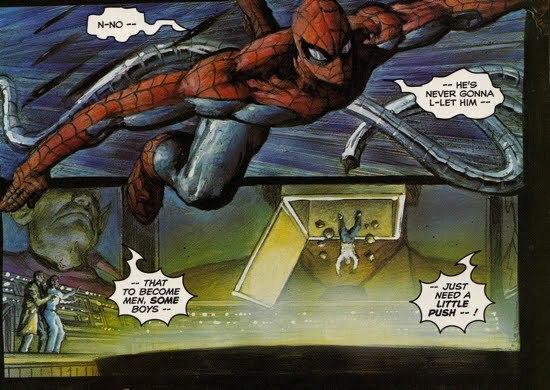 Despite that very public defeat, the idea that Norman was also the Green Goblin had only reached the level of 'vague innuendo and unfounded rumors' as Harry pointed out in Spectacular Spider-Man #200. 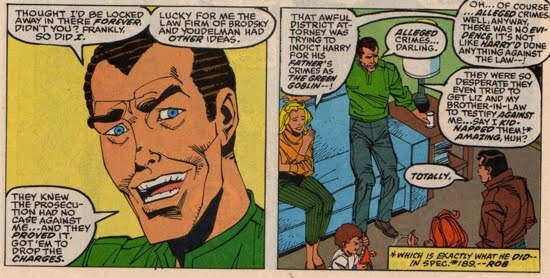 Interestingly, back in Spectacular Spider-Man #199, the District Attorney tried to pin Norman's crimes on to Harry because of Harry's arrest as the Green Goblin in Spectacular Spider-Man #189. That suggests that the authorities were at a loss as to who the original Green Goblin was, and thus Norman had everyone pretty much fooled. 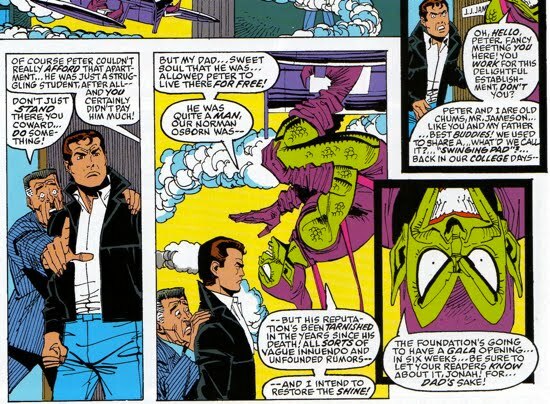 Regardless, Harry's attempt to create the Osborn Foundation was aimed at squashing any lingering idea that his father may have been the Green Goblin. Did Harry 'doth protest too much'? Most likely. And any investigative reporter worth their salt would have been on top of that connection and pieced it together with the already established 'rumors' of Norman's involvement with the Green Goblin. Harry died shortly after with the general public completely aware that he died as the Green Goblin. But Harry's death muddied the waters as Ben Urich still struggled to uncover the truth behind the Green Goblin's identity. In the one-shot Spider-Man: Legacy of Evil, Urich takes a leave of absence from the Daily Bugle to finalize his book on the history of the Green Goblin. At this point Urich had deduced that both Norman and Harry had a run as the Green Goblin, the only question that remained was when did Harry take on the mantle of the Green Goblin? In the course of his investigation, Urich found himself in the midst of another one of Harry's 'posthumous' (of course as a result of Spider-Man's Brand New Day we know that Harry never actually died) plots. Harry used robotic female Goblins (aka The Goblinettes) to abduct his son Normie and provide him with his birth-rite, the Goblin Legacy. Urich, Spider-Man, and Mark Raxton (aka Molten Man) teamed-up to rescue Normie and to uncover what Harry meant by the Goblin Legacy. In their effort to find Normie, the trio visited various locations that were significant to both the Green Goblin and Spider-Man. Before visiting the Brooklyn Bridge, Urich suggested that it was 'the bridge where Harry Osborn murdered Gwen Stacy?' 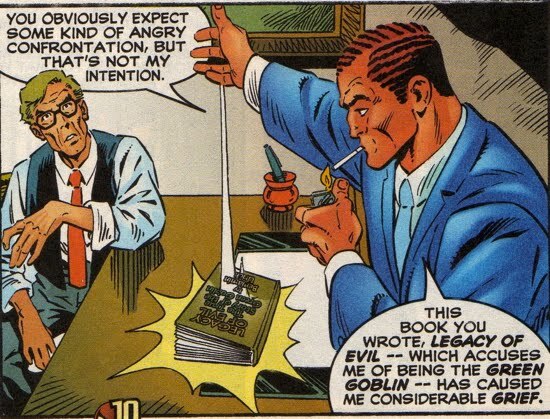 Urich had observed a changed in the Goblin's behavior from aspiring crime-boss to psychotic mad-man and he believed that change signified Harry's assumption of the Goblin mantle. Spider-Man was forced to correct Urich and that moment represented the first time Urich was clear as to what Norman and Harry had done during their individual tenures as the Green Goblin. The group would eventually track down Normie at an abandoned Goblin hideout where the young boy was suspended above a vat of the Goblin Formula. Spider-Man saved the boy without a moment to spare, safely returning him to his mother. Urich witnessed the entire series of events and after the dust settled he questioned Spider-Man as to what happened between he (Spider-Man) and Norman Osborn that changed him from 'the power-hungry crime lord to a revenge-obsessed lunatic'? Spidey nearly offered up an answer but then decided to keep it to himself, the truth may have compromised his alter ego's secrecy. 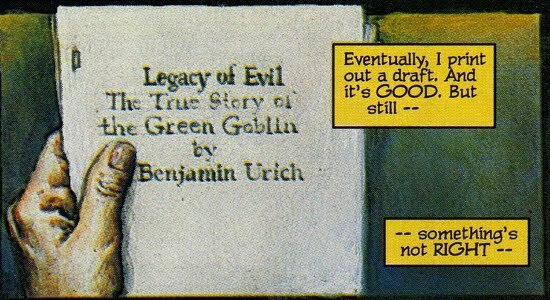 Having the record set straight, Urich finished his work on the history of the Green Goblin, but at the last minute decided to change the title to The Dynasty of Evil. Urich's submission of his final draft over to his publishers represents another critical milestone in the relationship between Jonah and Norman. It would have been at that point that Jonah would have had no other choice but to accept the fact that his former 'close friend' was the murderous Green Goblin. In Peter Parker Spider-Man #75, both Jameson and Urich received first-hand confirmation that Norman is/was the Green Goblin after he attacked the entire Daily Bugle staff. Osborn's attack on the Daily Bugle was one of his earliest plots after returning from exile in Europe. Norman's return is further explored here. 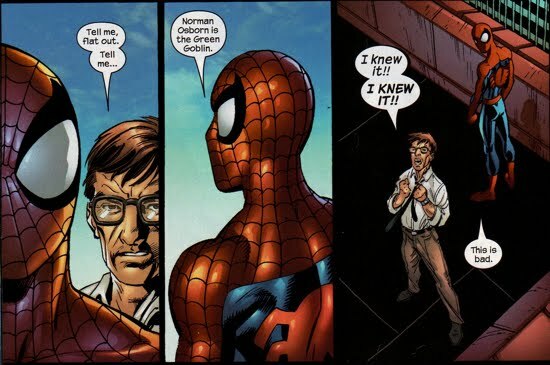 In the one-shot Spider-Man: The Osborn Journal, Norman confesses to have been completely unaware of Harry's 'posthumous' plot to abduct his son Normie. This side-note becomes quite interesting in light of the Brand New Day status quo in which Norman was aware of (and helped arrange) the faking of Harry's death. So, one would have to assume that Norman knew Harry was not dead but that he also did not know every trap that Harry had left behind. As an interesting side note, Urich's changing of his title from Legacy to Dynasty must have been vetoed because when the book hit the stands it was titled The Legacy of Evil. Of course, Norman would soon resurface and he would have words with Urich in regards to the book. Osborn's effort to debunk Urich's work can be found here. Norman was very successful deceiving the public about his past. After taking over the Bugle and using it as his own propaganda machine, the general public was certainly dissuaded from the truth published in Urich's book. However, it all came crashing down for Norman after he recklessly killed Daily Bugle reporter Terri Kidder and left her body for the authorities to discover. Norman's eventual downfall is explored further here. Despite the traumatic series of events that led to Urich uncovering the truth behind the Green Goblin, he somehow managed to forget that Norman Osborn was the Green Goblin. Crazy, right!?! In The Pulse #4, Spider-Man informs Urich that Norman Osborn is the Green Goblin...how did Urich not remember that? Sounds like a potential continuity flub. 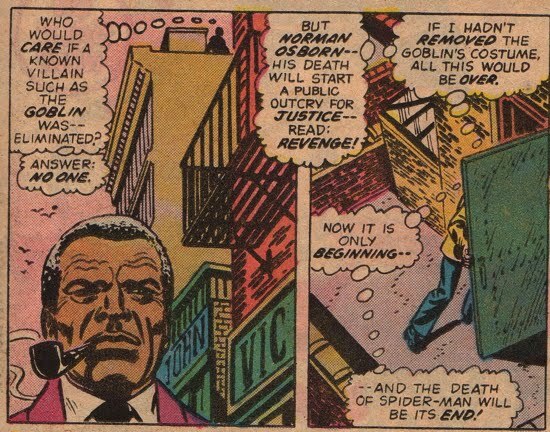 Peter Parker put the final nail in the coffin as he removed any doubt on Norman's history as the murderous Green Goblin when he publicly denounced him. 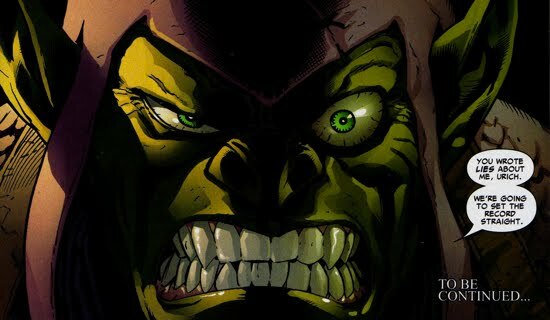 After Peter unmasked as Spider-Man at a press conference during the Superhuman Civil War, he also outed Norman Osborn as the Goblin in Civil War Front Line #2. 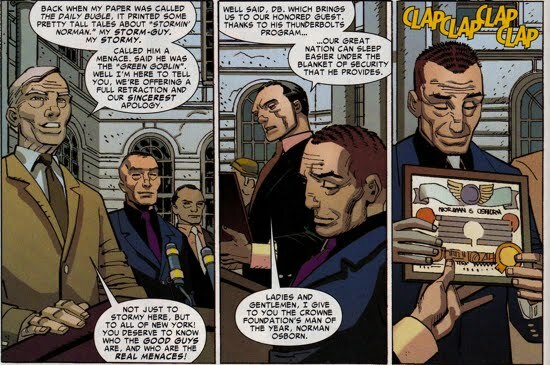 This act by Parker inevitably drove Osborn to become a tool for the government, a path that would eventually lead Norman to replace Stark as the director of S.H.I.E.L.D. Ironically, Peter's announcement led to two interesting developments in the saga between Urich and Osborn as well. First, when Osborn was sanctioned by the government to use his Goblin persona to help with the Initiative, his first target was Urich and he wanted to settle the score for the multiple times Urich outted Osborn publicly. Second, due to Urich's paranoia regarding Osborn having been somehow released from prison, J. Jonah was forced to fire Urich from the Bugle because he did not trust the newsman's instinct that Osborn was freed somehow. Urich would eventually rejoin the Bugle but soon after he started his own paper called the Frontline. The tension between Urich and Osborn only increased after the defeat of the Skrulls during their infamous Secret Invasion. Osborn, who fired the kill-shot on the Skrull Queen Veranke enjoyed a meteoric rise to power as he rode a public sentiment of distrust toward Tony Stark and S.H.I.E.L.D. 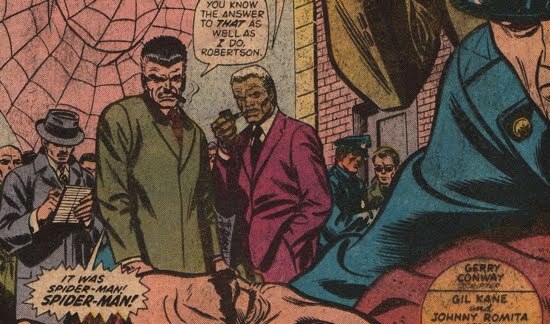 However, Urich wasn't convinced that Osborn was a hero and he confronted Osborn during a press conference where the President of the United States announced Norman's new role. This interaction was featured in Secret Invasion Front Line #5. Urich was unsuccessful in swaying public opinion but his anger toward Norman's status as America's top cop broke his case of writer's block as he began an attack on Norman's false-persona as a hero. 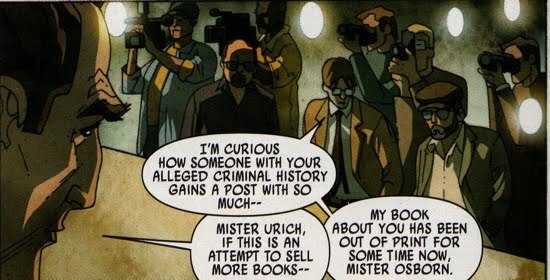 Interestingly, Urich was alerted to Osborn's new role by a fellow member of the media who mentioned Urich's book about Osborn called Legacy of Evil...once again suggesting that the published title was not Dynasty of Evil but rather Legacy of Evil. Though Norman Osborn would continue to go in and out of public favor through the course of leading two different Avengers teams, Norman's dark side would always creep back out. Whilst operating under the fake persona of Mason Banks, Norman orchestrated the events of Goblin Nation, which turned NYC into a warzone. 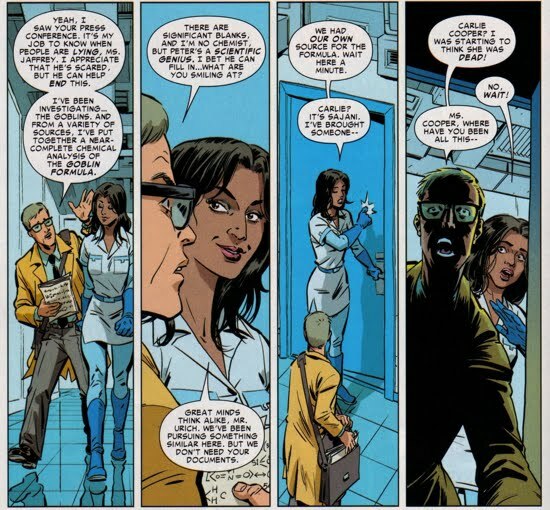 Urich would contribute to Osborn's defeat by helping Sajani Jaffrey develop a cure for the Goblin Formula. So aside from amassing evidence to build a case against Osborn (and to write a book about him), Urich also gathered analytical chemical data on the Goblin Formula itself...pretty impressive! Although later stories would show that the title Dynasty of Evil was changed back to Legacy of Evil (as in Spectacular Spider-Man #254, left side of page); the book jacket design shown above has Dynasty of Evil as the book title (from Green Goblin #1). So its not clear when it was changed back.